“Caribbean Wind” is a song waiting for a cult, or rather waiting for an author like Dan Brown to use it as the text for his next cracking the ancient code suspense novel. It’s a mysterious song and the more it’s listened to the more haunting it gets, especially when his live versions change so much from the lyrics supplied on bobdylan.com (Dylan admits to there being at least 4 sets of lyrics for it). With John Milton (Paradise Lost), Dante (The Divine Comedy) and Jesus alluded to in the first verse it begins as a playground for symbology. It consists of 6 verses with a chorus sung 3 times. The rhyme scheme is consistent throughout: aabccb. And there are some clever rhymes in it, e.g. comedy/embassy, pawn/wore on, snare/there, report/short. “Some times you’ll write something to be very inspired, and you won’t quite finish it for one reason or another. Then you’ll go back and try and pick it up, and the inspiration is just gone. . . . The inspiration’s gone and you can’t remember why you started it in the first place” (footnote in Christopher Ricks’ Dylan’s Visions of Sin 433). The song is out of Dylan’s own grasp as well: “That one I couldn’t quite grasp what it was about after I finished it.” The poetic form and rhymes are within our grasp and certainly his though, and maybe there’s more there to grasp than Dylan’s letting on. Was he being purposely dismissive about it to keep attention away from it? I like thinking so. It just adds to the song’s aura, its mystery, its “beware all you who enter” here vibes. Or is it more personal than Dylan feels comfortable admitting? It was after all selected for Biograph. With all the “you” references in the quote above maybe the “she” in the song is Dylan. Just a theory. It’s a song begging for theories, pleading for meaning, pleading for someone to enter deep within it beyond the iron gates that protect it. Here’s the one from Biograph. The guy on the back cover of Love and Theft looks like someone who would sing “Bye and Bye.” Can’t you just picture him, with top hat and tail, dandy-like, sporting a cane that moves with his shoulders and legs to the beat of the tune? Songs like these are why I’d prefer that Dylan stuck to creating his own American standards rather than resurrecting old ones. Dylan likes being an entertainer, he likes to sound like one from any era–making the future a thing of the past as he does so. “Bye and Bye” is made of six verses, two of which are 2 lines long, the others, the first two and the fourth and last are 4 lines each. There’s a symmetry to that, 2 are made up of two lines, and 4, four. 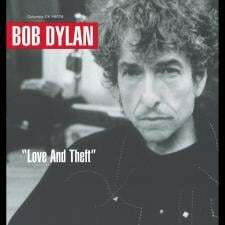 Dylan is loyal and true to other structures in the song, namely to his “sugar-coated” rhyming. The first three 4 line verses go abba and the two 2 line verses are simply rhyming couplets. He felt a change comin’ in the final verse, however. The first line in it ends with “sad” and the final word of the song is “be.” He was not loyal to the end. mad/sad and see/be are the final rhyming sounds of the verse. This happens in the other verses, too, but not to the negation of the terminal rhymes. Why? Well, who knows, but in the universe of this blog dedicated to Dylan’s rhymes, I wonder if something amusing is happening there in a wink wink bye and bye way. He’s gonna show us just how loyal and true and man can be? Well, that doesn’t mean a man can be very loyal and true, or maybe he can to a point, as with being loyal and true to a point with the rhyming pattern in the song. Here’s the studio version of the song, released in 2001.